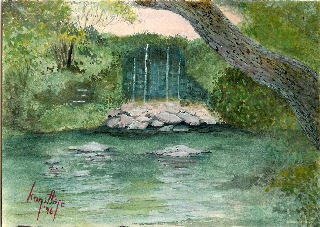 This is a watercolor painting of the Japanese Gardens in Fort Worth, Texas that my husband and I often visit. �We had spent the afternoon strolling the gardens and feeding the Koi. �The sun had almost �disappeared and the sky was starting to turn a soft shade of pink. �The white rocks of the falls had taken on the color of the sky. �We stood there absorbing the beauty of our surroundings and the magic of the moments just before sundown. �I just had to try and capture those moments in my watercolor. I love roses and my husband is always presenting me with lovely bouquets. �This rose was one from one of those bouquets. This painting was done on 140 pound watercolor paper with a cold pressed finish. �I used Yarka 1/2 pan watercolors. �I experimented with several different effects for the background. 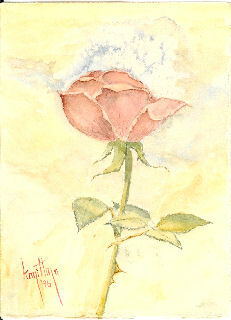 �One of my experiments was with salt.� Made for a very interesting effect.� Well, now tell me, what do you think of my rose?